This is the first post of a series I call "Out in the Westerwald: German Folk Songs." I want to present you back then popular German folk songs that have been around for many years and were popular well into the 1960s and 1970s. All recordings I will present are original, historical cuts from the 1920s up to the 1940s or 1950s in order to show the authentic tunes and lyrics as they were sung back in the old days. I choose German folk music not only because I live in Germany and I like the music a lot but also because of the fact that American folk music, in particular old-timey, has many sources in middle-European folk music styles. German folk has a couple of different styles: there are marches, polkas, waltzes, ballads, so-called Schrammel music (which will be explained in future posts) and some more. This can be compared to Irish and American folk music culture, some examples are blues, breakdowns, ballads in America, jigs and reels in Ireland. The influence on old-time can be seen in various songs, such as "Under the Double Eagle" or "She'll Be Coming Around the Mountain." The latter has nearly the same tune as a song called here "Von den blauen, blauen Bergen." Today's tune of German folk music also bears some slight similarities to "Von den blauen, blauen Bergen." This song is called "Lore, Lore" and is also known sometimes as "Im Wald, im grünen Walde." It's a march and was known widely in Germany. Marches derived from military bands because the 4/4 meter is perfect to march with and they are still played a lot here. The lyrics are traditional and although this recording is political motivated, tune and lyrics differ not much from other recordings. The marching band here is the "Musikzug der SS-Standarte 42", conducted by Alexander Heinz Flessburg with vocals by the SA-Sturm 25/10. 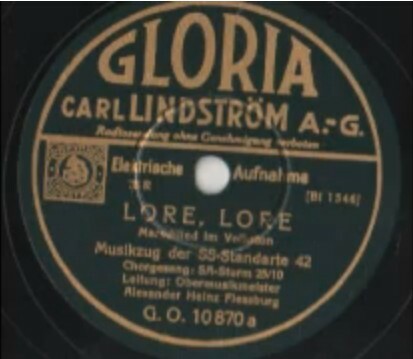 The recording was made in the mid-1930s for Gloria, a label that was owned by the Carl-Lindström-AG. 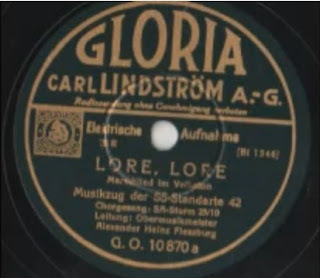 Other historical recordings of "Lore, Lore" were made by Carl Woitschach's orchestra with vocalist Kurt Mühlhardt (Kristall 2088) and by the 11 Batl. Inf. Regt. 17. Göttingen Musikkorps with the 7. Kompagnie on vocals, conducted by A. Muhs (His Master's Voice E.G. 2843). As with many other German folk songs, its popularity waned after WWII because the national socialists heavily used folk songs for their propaganda. Altough it is still familiar with older people and the military, "Lore, Lore" is mostly forgotten today. The brown heritage is greeting, the right hand up! Tuba god, ebay has possibly some of them. Where is Franzl Laing? I remember him from my once in a lifetime (so far anyway) trip to Europe. He was very big all over Switzerland, Austria and Germany. I'm only 15 and an English speaker and I love this song. It appears that this was used by the Panzer corps from what little information I can gather. There's a very well made video on YouTube showing scenes of German tanks on the channel "Fire and Steel." It's a shame to see so much history, most importantly music, falling victim to Orwellian censorship. I've amassed a large Archive of music and historical documentation from around the world to save as much as I can from the PC Corporate Censorship campaigns.